Millennials and the frenzy around social media are alone enough to force banks to rethink strategies. Invite the PSD2 directive to the party and you’ll get the message: 2018 will bring serious change to the financial sector. But along with threats come opportunities. On one condition - you need to be bold in your use of data and have to act fast. At Netguru we are excited to challenge the status quo and be a part of the digital transformation. We also love to keep our ear close to the ground. So we talked with the man who sits in the centre of the “banking apocalypse”. 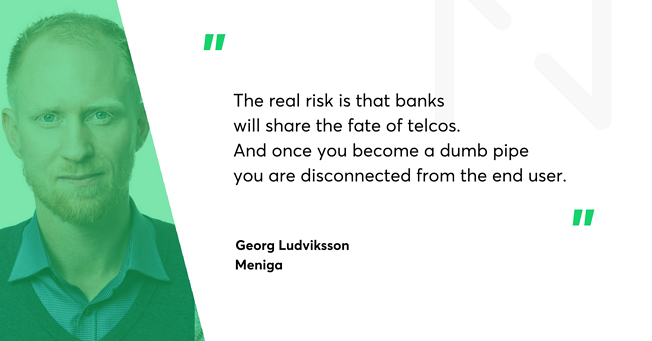 Meet Georg Ludviksson, CEO and co-founder of fintech startup Meniga, one of the largest white-label digital banking software providers in the world. Meniga was born in Iceland, a European country strongly hit by the financial crisis. The Lehman Brothers collapse strained the whole banking sector. In Iceland, it led to the default of all three major commercial banks and plunged the small country into a deep recession. There is a saying that a recession is a good time to start a business. Ludviksson was just coming back from the United States to Europe. Back then, he observed a rise of new players, like Mint.com, in the finance sector. 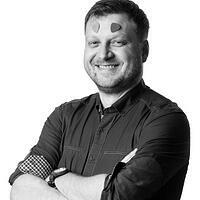 So Meniga started selling software that helps people manage their personal money. Skip to the year 2018 and the company’s main focus is working with banks on their data and improving engagement in digital banking. As Ludviksson puts it, "a meaningful engagement". If it sounds ambiguous, a quick explainer. Take Friday lunch. You go to the Italian restaurant, order pasta with shrimp and a glass of wine. After your pay, the receipt and your bank account only show very basic data: the exact amount and tax, the place and the date of the transaction. Meniga broadens the context. They invested heavily in big data and analytics to come up with software that analyses the data hidden on bank servers. Doing this and adding external information gives customers a more complete view of how they are spending their money. For instance: you could see how much you’ve been spending in restaurants in recent months. You could see how your spending habits evolve over time. Ludviksson believes that his company and banks can give clients a better understanding of what’s going on with their money. “We can improve the financial literacy in our society” - says Ludviksson. Meniga could also offer “product discovery” similar to the experience you get with Netflix or Amazon. So, after a visit to an Italian place, you could get recommendations about where other pasta lovers tend to go in the area. And it works. By doing that sort of simple banking magic the company is able to boost engagement rates by a factor of three or four. And when customers are engaged, they are less likely to think of moving somewhere else. The business is booming - Meniga’s revenues grew 50% last year, to approximately 13m euro. Its software is used by banks with more than 50 million clients, such as Santander (Spain), Intesa Sanpaolo (Italy), ING (Netherlands) and mBank (Poland). Tomasz Grynkiewicz: Georg, you’ve been working with banks for a few years now. How would you describe the state of the industry on the eve of changes? Afraid of disruptors, waiting in the trenches or getting ready for a tough fight? Georg Ludviksson: Their awareness is definitely growing. Banks know that new players are coming. They know that their business is under pressure. Low interest rates, record VC investment in fintech and changing regulation that gives others access to individuals data. In addition, the tech giants - Google, Facebook, Amazon or Apple - might be attracted to the market. There have already been interesting developments in China - Alibaba and WeChat are taking on a big role in financial services surprisingly fast. So the clock is ticking, and there is no way back. PSD2 forces banks in the European Union to open their data to basically any third party provider. And if the banks don’t provide their customers with a more relevant, more insightful experience, then someone else will. From your perspective what is the most important change that PSD2 will bring to the market? I feel that the effect might be very similar to what we’ve already seen in the apps ecosystem. We have gotten used to allowing different apps to access our data, photos, friends or location. After the implementation of PSD2 it will be possible for any startup, or Google, or Amazon, to ask for your banking data. And, as long as you give permission, that company would be able to make transactions on your behalf. This will create a lot of new services and business models based on data. We are still in the very early days of that transition. But at the end of the day banks should become something more than a platform to do regular banking stuff. How are the banks reacting to the new challenge? We can distinguish three main strategies. First is just “wait and see”. We don’t invest, we stick to basic compliance with the new rules. I know a few banks which don’t believe that the rise of digital and fintech will have any substantial impact on their revenues or profits. But that’s a very risky strategy if you ask me. “Let’s embrace this”. In this scenario banks try to do their best to become the best API provider. They feel they could use it to help their business model, to create new revenue streams and new side-businesses. Like Amazon did - it is still a major retailer, but also has a great cloud web service. The Spanish BBVA is probably the best-known bank that has taken this approach the furthest. Nordea recently announced a major open banking initiative, and there are many others joining the pack. What is in it for the banks? If done properly, they become the bank of choice. The bank that every fintech wants to cooperate with. This way they can pick the most promising fintech companies to work with, experiment, learn new technologies and solutions. The third attitude is to take this very seriously and fight for customer relationships. Millennials, if you ask them, will be more than happy to get their banking done with Google, Facebook or Amazon. Even with all the privacy concerns this is still something which banks should take into account. But the banks won’t go away, even if they lose to fintech. Of course not. The impressive growth of fintech was possible because banks were reluctant to use their data, to experiment. But they still hold the data, and data is the key to any personalised banking experience. The new business models, how to make money on top of the banking system, are still unproven. Remember, banks would be the ones to inject capital into the market, lease money. But the real risk is that they will share the fate of telcos. And once you become a dumb pipe you are disconnected from the end user. Invest in improving the user experience, take your UX and UI to the next level. Start showing users that you care for their well-being, help them manage their money. Educate them so they have no reason to go elsewhere. And be brave with experiments. Take a look at ING - they recently launched an app in the UK market where they don’t even operate! You mentioned a very interesting and groundbreaking step - go beyond banking. But how? Think of a bank not just as a place to do banking. Think of all the data that might be connected with different ecosystems. For instance, I'm having these conversations with bank leaders about advertising data. The question is: should they be competing with Facebook and Google on their own turf? Our answer is absolutely. Think of creating an advertising ecosystem inside a digital bank, based on people’s spending history. Think of a platform that merchants could use to create special offers for customers. That sort of thing. If you do that well, you can create enormous value for your users and a brand new reason to visit the bank. If you work at a bank, build a good API platform for strategic options. Use it to fight for customer relationships. Go beyond compliance - whether it means improving your own digital banking experience or working with selected fintechs. Do not reinvent the wheel, learn from the best on the market. Start developing new revenue streams, keep track of what’s happening. Create more value for customers before others get their foot in the door. Act fast - launch projects in months, not years. If you need to reorganize your company to move faster, do it. 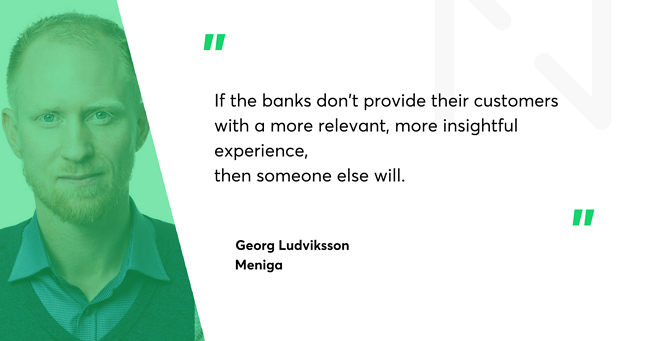 The interview with Georg Ludviksson was conducted during Impact CEE Fintech 2017. Netguru appreciates all the help from the Impact team! We hope to join you in 2018.